Also known as media specialists, librarians have seen their numbers slashed by 62 percent since 2003, compared to a nationwide drop of just 17 percent. Michigan now ranks 47th among the 50 states in the ratio of students to media specialists. “At the same time that all those people were being cut, our reading scores have plummeted in this state,” said Kathy Lester, a full-time media specialist in Plymouth-Canton and advocacy chair of the Michigan Association for Media in Education. A recent study by a University of Michigan professor found that since 2003 Michigan students have shown the least growth nationally on the National Assessment of Education Progress (NAEP), often called the nation’s report card. Michigan has fallen to the bottom of state rankings in reading and math proficiency as well. Over the same period in many school buildings across the state, libraries have been shuttered altogether – with those spaces reorganized for other uses. Elsewhere, libraries remain but uncertified employees have been reshuffled to staff the circulation desk alone. Only 8 percent of public school buildings in Michigan have at least one full-time media specialist. Certified teacher-librarians do more than check out books. Media specialists provide expertise and professional support in how to integrate technology with teaching in meaningful ways. They offer students specialized instruction in information literacy. With a big-picture view spanning grades and subject areas, they help align curriculum vertically and horizontally. “These are not your grandma’s librarians anymore,” said Judy Bowling a former elementary school media specialist in Livonia who recently became a library consultant at Wayne RESA, providing services and support to 33 public school districts in Wayne County. Media specialists still purchase and recommend grade-appropriate books for pleasure reading, Bowling said, and that’s an important role in many areas where low-income students have little access to high-quality reading material at home. But with degrees and certification in Library and Information Science, they also serve as school and district leaders in literacy and technology in areas where they have survived the budget axe. Livonia schools media specialist Brian Chinavare teaches research and critical reading skills to classes that come to the library. He helps teachers learn to use technology and troubleshoots issues. In addition, he has created a “maker space” at Frost Middle School where students can experiment with electronics and learn to write code to program a bot to move as directed. 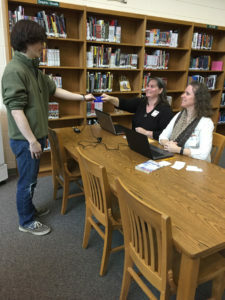 This year in Clintondale, Mike Ward returned as a media specialist in the library that connects the high school and middle school – five years after the district cut librarians in a budget crunch. In his role promoting 21st Century skills and literacy, Ward finds and learns new apps and programs and trains teachers to use them if they choose. Ward says, “We’re all teachers of reading,” regardless of content area, and he’s also an early adopter of new technology. He believes in a “TLC” philosophy of teaching – marrying Technology, Literacy, and Content. In Traverse City, media specialist Genevieve Minor teaches, helps to align curriculum, finds resources for classroom use, and trains teachers. This year she also arranged for more than 900 high school students to get Traverse City District Library cards issued during school hours. Students now have access to the public library’s rich databases. But her goal was bigger than that, she said. In Clarkston, the number of librarians has dropped from five years ago when one worked in every building, but the district has kept as many as possible. Laura Cadreau now works as a media specialist in two elementary schools and tag teams with a paraprofessional, Karen Fallis. Cadreau teaches information literacy classes and serves on the district’s information literacy team. Fallis manages circulation and troubleshoots technology issues. She also helps students research and learn how to find resources through progressively complicated scavenger hunts. Without guidance, students think research is surfing Google to find facts to cut and paste into reports, Fallis said. “They’re very savvy at manipulating the data on the screen, but it’s critical we teach them how to do research in ways other than just Googling it,” Fallis said. The decline in media specialist jobs statewide has decimated the professional pipeline, said Sandra Yee, dean of the Wayne State University Library System. In 2004, 63 people were studying Library and Information Science at Wayne; today, that number is six – an all-time low, Yee said. The trends in Michigan don’t make sense, says Livonia’s Brian Chinavare.